Model mentor: Matthew State still sees patients at a community health center while juggling multiple roles — as geneticist, teacher and administrator — at Yale University. Soon after arriving at Yale University in 1999 to begin work on a doctoral degree in genetics, Matthew State found his way to a community mental health center in Branford, Connecticut, a small town eight miles north of New Haven. He signed on as the center’s only child psychiatrist, treating low-income children for anxiety disorders, depression, autism, schizophrenia and psychosis. These days, as co-director of the Program on Neurogenetics and deputy chair of research in psychiatry at Yale, he commutes weekly between Manhattan, where his wife and 13-year-old daughter live, and New Haven. But he still spends every Wednesday at the center, from 1 p.m. well into the night, and remains on call for his patients there. Dedicated child psychiatrists may not be a rarity, but State is among the few who can also lay claim to a career as a world-class scientist, delivering breakthroughs in autism genetics. State’s work in 2005 on the SLITRK1 gene, associated with some forms of Tourette syndrome, was cited as a top scientific breakthrough that year by Science magazine. 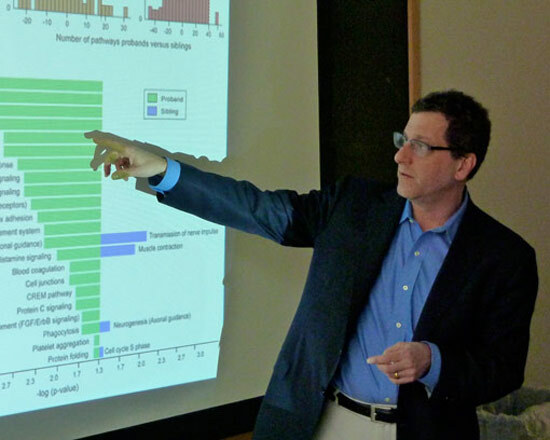 In autism research, he is best known for identifying the risk gene CNTN4. His laboratory is one of two teams sequencing and analyzing samples and data from the Simons Simplex Collection (a project run by SFARI.org’s parent organization), a repository of genetic samples and clinical profiles from more than 2,500 families. State is not only a fine researcher himself, but a stellar team player, notes Bernie Devlin, professor of human genetics at the University of Pittsburgh, and State’s collaborator. Ironically, State never intended to become a physician or biomedical researcher at all. Growing up in a politically active family, he intended to build a policy career in Washington D.C. While still an undergraduate at Stanford University, he landed internships with Senator Ted Kennedy and at the Carnegie Endowment for International Peace. Deciding that he wanted to have a more personal impact on people’s daily lives, he returned to Stanford for his M.D., and did a residency in child psychiatry at the University of California, Los Angeles. Even so, the negotiating skills State picked up during his stint on Capitol Hill, combined with a temperament that naturally seeks to reconcile different points of view, have become key factors in his success as a researcher, physician and administrator. Just about everyone who works with State comments on his almost uncanny ability to drill through to the nut of a problem and to integrate disparate perspectives to find workable solutions. Krystal was so impressed by State’s energy and capacity to engage people that he asked State to be his deputy chair two years ago. At Yale, child psychiatry and psychiatry are separate departments, Krystal notes, so having a child psychiatrist serve as his second-in-command is quite an anomaly. State has since worked to bring together a research council of senior investigators across disciplines at Yale. “Our goal was to break down those intellectual silos and look for common interests and opportunities,” Krystal says. State’s perspective on this approach came from another epiphany of sorts — when he was training to be a psychiatrist at Stanford. “I was taking care of kids with severe illness and thought that I really needed to understand genetics,” he says. With no background in science, “I felt like I had to start from the beginning.” He decided to get a Ph.D. in genetics. Donald Cohen, then chief of child psychiatry at Yale, was among the only people open to this approach. He allowed State to get his Ph.D. while he was a junior faculty member in the department. “[Cohen] had thought for a long time that it was important for child psychiatrists to have a stronger grounding in science, so he created this really unusual situation for me,” State recalls. Over the years, however, he’s come to recognize that no one approach is likely to identify the causes of autism. “The genetic architecture of autism is likely to include both common and rare variants,” he says. State says he spends much of his time at clinical conferences persuading physicians to screen for genetic disorders. This is important for families both medically — because carrying certain chromosomal deletions can result in severe medical issues — and emotionally. This sort of sensitivity to the emotional needs of families at the Branford Counseling Center has impressed Trapazzo even more than State’s encyclopedic knowledge of genetics and disease. Dr. Matthew State has been my son’s doctor for quite awhile now and we think the world of him. He is completely dedicated, has a fantastic rapport with his patients and is extremely knowledgeable in his field. We just love him. I have worked as a Speech Pathologist for 40 years, and still working with children with autism. I am fascinated by the research in genetics and biomedical approach to autism. I really want answers for these children and their families? I am tired to taking the bull by the tail. I have attended a few conferences in the uk. There is not much talk here on this topic. I would love to have studied genetics for my doctorate, rather than in special education. I feel for the brain, the guts and the senses of the children I work with, I feel for their parents. How can I streamline available results? Advice please. further study? Back to basics? Although I may be biased, I would say following SFARI.org is about the best way to keep up on autism research news, especially if you want some of the discipline-specific jargon and technical terminology translated into digestible reading. Signing up for our newsletter is a convenient way to do that (http://sfari.org/about-sfari/press-room/newsletter), or follow our Facebook page (https://www.facebook.com/SFARIAutismNews). For a deeper dive into the data of individual researchers, check out our monthly webinar series (http://sfari.org/sfari-community/community-blog/webinar-series). State sounds like a wonderful professional dedicated to his patients. However, one only wishes State’s research would provide more hope and help to families affected by autism. Maybe his close work with families will provide more incentive to focus on the practical rather than the long, long shot academic work. Hard work and good intentions seem to be running a parallel, not intersecting line to progress for people affected by autism.